Bronze medallist Emily Fiedler competes in the State Multi Events. 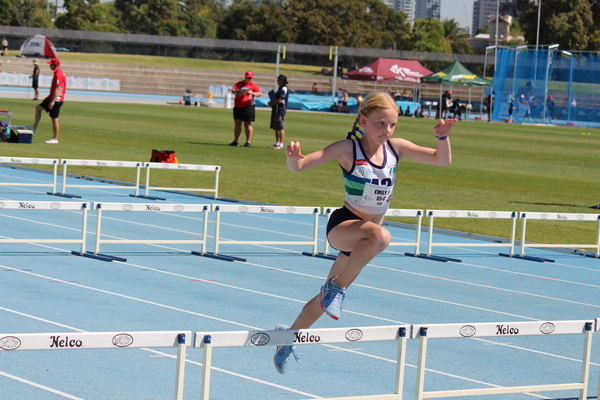 Yarra Ranges Athletics athletes took to the track at Lakeside Stadium over the weekend for the 2019 LAVIC Combined Events Championships. Athletes compete in a set group of events, accruing points based on performance, similar to a decathlon. Yarra Ranges had 10 athletes compete with the best Little Athletics athletes in Victoria, with some outstanding performances. The very hot conditions challenged athletes and parents. Watching all the kids finish the day doing 800 metres was inspiring. They gave their best efforts with many breaking multiple person bests during the competition. Emily Fiedler was the club’s only medallist for the day, placing third in the under-9 girls. The club’s other little athletes enjoyed a personal best-filled morning on Saturday. Its seniors competed in round 11 of the AV Shield. With one round to go before finals, Yarra Ranges has a very good chance of qualifying all five teams. Next week the club competes at Nunawading, and some athletes will be competing in the Box Hill Classic on Thursday night. Training is on every Tuesday and Thursday night from 6pm. It’s not too late to get involved in either Little Athletics or the senior competition with Athletics Victoria.